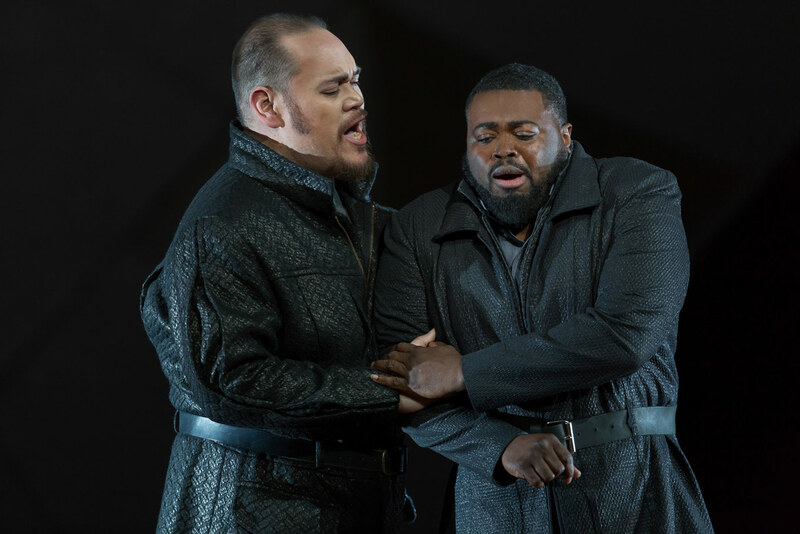 Quinn Kelsey (Rodrigo) and Eric Owens (King Philip) in Washington National Opera's Don Carlo, 2018. Photo: Scott Suchman. This is what a mysterious friar, in fact, the ghost of King Charles V, tells the titular Carlo who is sick with angst as the woman he loves is forced to marry the tyrant King Phillip II, Carlo’s own father. Quinn Kelsey (Rodrigo) and Russell Thomas (Don Carlo) in Don Carlo, WNO, 2018. Photo: Scott Suchman. The spectre of death looms gloomily over WNO’s new co-production of Verdi’s Don Carlo, directed by Tim Albery, as it would in the mind of a prince who knows he can only ascend the throne upon death of his father. The curtain rises to the mournful French horn tones in the opening scene (this production of the shorter, Italian version of Verdi’s opera is in four acts) set in a catacomb, the set, designed by Andrew Lieberman, gives the effect of looking directly up at a cathedral’s domed ceiling, as if you yourself are lying in the tomb, forced to watch the opera’s doomed characters and powerless to intervene. Just as the horrors of the Spanish Inquisition serve merely as backdrop for this family drama, so does Lieberman’s set exist as a visually striking one for what amounts to a very traditional staging of a very traditional opera, verging on the much maligned “park and bark.” However the singing on Saturday evening was so magnificent that any staging at all was almost superfluous to the glorious sounds filling the opera house. Russell Thomas (Don Carlo) in Don Carlo, WNO, 2018. Photo: Scott Suchman. If you were asked to come up with a fantasy cast for a hypothetical production of Don Carlo, you’d be have a hard time assembling a lineup better than the one at Saturday night’s performance. 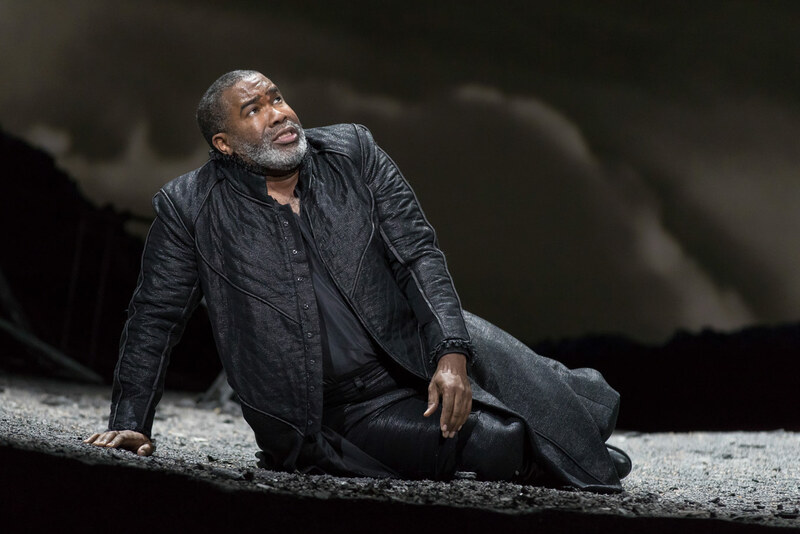 Tenor Russell Thomas sings the title role with clarity and passion, and not a hint of the strain which is all too common in this repertoire. Throughout their duet, his voice blends seamlessly with Quinn Kelsey’s Rodrigo. Kelsey’s voice is as beautiful as baritone voices come, velvety and warm, with limitless legato. 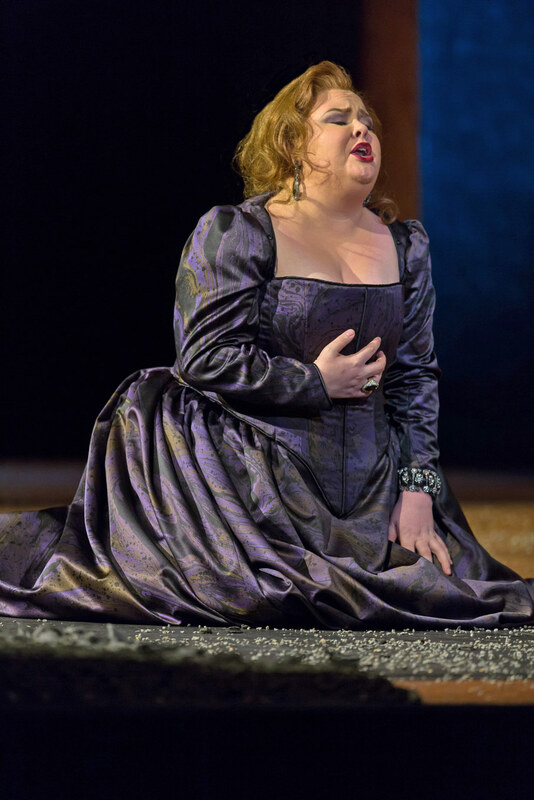 In the role of Elisabetta, soprano Leah Crocetto offers a girlish sweetness and soft nobility. Her voice still packs a punch, soaring above the dense Verdian textures when the score demands it, although she occasionally wavers a bit on soft, high attacks, especially later in the evening. As the tyrannical King, Eric Owens brings his signature growling bass and a searing stage presence, casting chills over the audience with just a glance, or with the whispered threat, “beware the Grand Inquisitor.” Andrea Silvestrelli lent his imposing stature and room filling bass voice to the role of the Inquisitor. 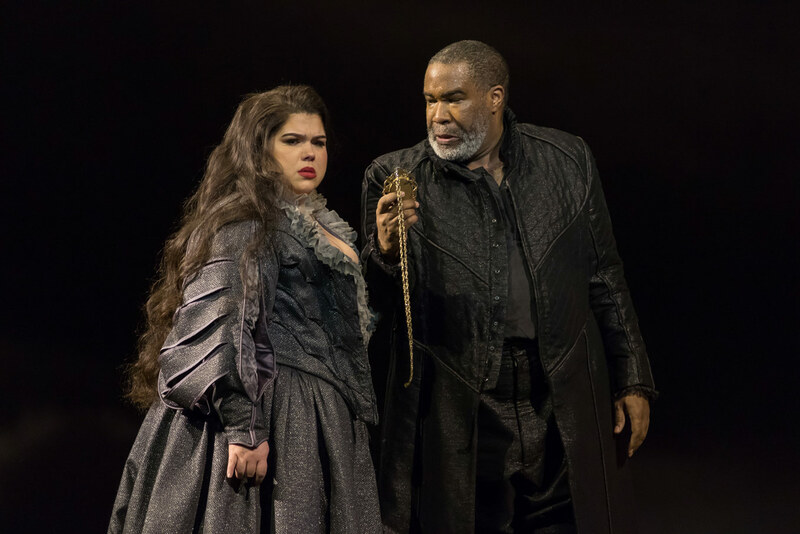 Leah Crocetto (Elisabetta) and Eric Owens (King Philip) in Don Carlo, WNO, 2018. Photo: Scott Suchman. This brings me to the highlight of the evening: Jamie Barton. In just the few years, she has rocketed to operatic super-stardom and with good reason. Even in a cast as extraordinarily strong as this one, Barton rises above. The audience was hers as soon as she stepped on stage to sing her first lighthearted aria “Nel giardin del bello,” and she radiates such boisterous joy in singing it that it’s impossible not to be taken under her spell. Then later in the Act II trio, she alternates lines of exquisite bel canto lyricism and then shoots declamatory passages like laser beams into the upper tiers of the opera house. Her “O don fatale” elicited one of those magical operatic moments where time stops, and at the end of her final phrase you realize you forgot to breathe. Jamie Barton (Eboli) in Don Carlo, WNO, 2018. Photo: Scott Suchman. The orchestra, conducted by maestro Philippe Auguin, sounded rich and warm, but was unfortunately allowed to swallow up the singers from time to time. The WNO chorus, I would put up against any that of any opera house in the world, and in the auto-da-fè scene they sounded as good as I’ve ever heard them singing with the strong vocal and musical abilities of a world-class opera chorus, but also managed to convey the outward piety undergirded with inner terror of living under the threat of the Inquisition. This kind of vocal and musical acting from a chorus is a rare gift that sets WNO apart from other American houses. 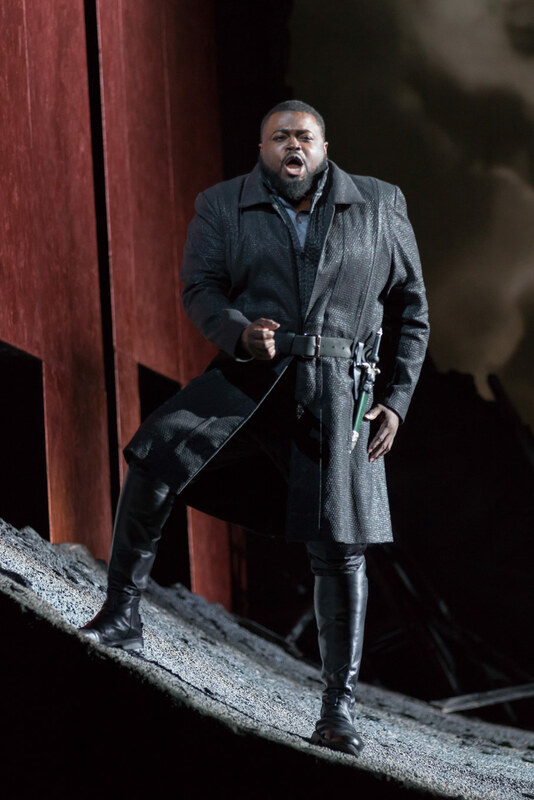 Eric Owens (King Philip) in Don Carlo, WNO, 2018. Photo: Scott Suchman. The melodrama of Don Carlo is somewhat frivolous despite its serious historic undertones, but Albery’s staging is effective if not innovative. In the second half of the production, Lieberman’s set transforms from a sunlit church to a ruin, the domed roof apparently crumbled away to reveal a stormy sky. “The peace you seek can only be found in heaven,” but the heavens aren’t looking much more peaceful than the action below as the King threatens his own son with a heretic’s execution and the people threaten to rise up against the King. Carlo is slow to learn exactly what the friar’s words mean for him even as Elisabetta points out to him the absurdity of the only solution to his problem: murdering his father to take his stepmother to the altar. The main draw for WNO’s production - its singers - makes it a can’t-miss performance, onstage through March 17.